The NCOA’s survey, which was funded by Reverse Mortgage Funding, a lender, uncovered one reason for the lack of interest: retirees are not clear about how reverse mortgages work and how they differ from a standard home equity line of credit. There was considerable confusion – and skepticism – about reverse mortgages in the NCOA’s surveys and focus groups. When the loan terms were described, but the name “reverse mortgage” was replaced with the generic “Product B,” homeowners preferred it over a traditional line of credit called “Product A.” They had less interest when the term “reverse mortgage” was used to identify the loan, rather than Product B. Researchers have found other reasons that people find them unappealing, including their relatively high cost and a desire to leave something – the house – to their offspring. If someone takes out a reverse mortgage on their home and suppose they die within a year, is the entire home turned over to the company who granted the mortgage or can the value less the amount paid out plus interest – be inherited? By the way, I think that the term “reverse mortgage” has a very bad reputation among us older folks because many of us do not trust banks and mortgage companies. We are worried they will seize our homes on some financial technicality as was done during the last financial crises. Here’s the answer from our resident reverse mortgage expert. Of course buyer beware: As with any financial product, be sure to read the fine print and ask a lot of questions! 1. The amount borrowed plus interest must be repaid. If there’s equity leftover when your offspring sell the house, that’s theirs to keep. 2. If not repaid, and only if not repaid, the bank would foreclose. 3. But if the amount received from selling the house (whether by you or your heirs or should the bank foreclose) is less than what is owed, you (or your estate) owes nothing more — the amount owed is capped by the proceeds of the sale. The loan is federally insured. 4. And the bank CANNOT foreclose if the amount owed is greater than what the house is worth. The debt must be repaid (or house must be sold via foreclosure if the debt is not repaid at that time) only when you no longer live in the house. 5. I also believe the fees are somewhat higher than a regular mortgage. Peter, I just read your comment and the misconception about lenders taking the home at death or owning the home at loan inception are false. Just like all other mortgages, the home owner remains the owner of the property and can leave the home to their heirs. Only the principal balance plus interest, costs and mortgage insurance is paid back when the loan becomes due & payable. Your comment that the bank will seize your home is not possible as long as the borrower(s) continue to live in the property, pay their taxes and insurance and maintain the home in habitable condition – also just like all other mortgages. If you would like more information, go online to HUD.gov and enter in the search bar for reverse mortgages…they refer to them as HECM, home equity conversion mortgages. It has a bad reputation for a lot of folks because there have been some unscrupulous players in that market (as there are in a lot of different businesses). It’s also a confusing term – the government (or company) isn’t really buying your home and paying you interest as if you were a bank giving them loan. If someone has few savings to draw upon in retirement, there aren’t a tremendous number of options. 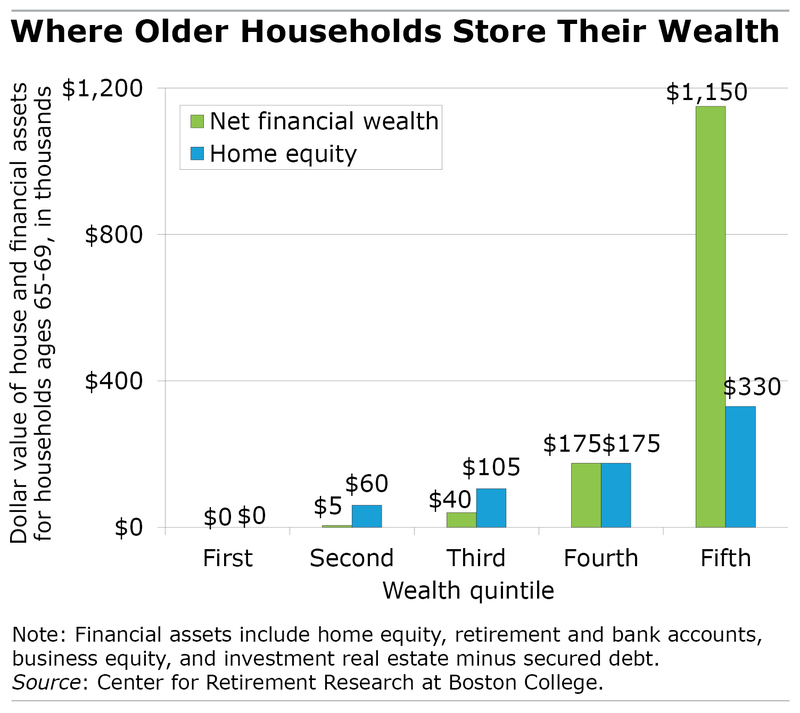 If there’s equity in the home, these are two good options and folks will need to learn how to navigate each’s benefits and drawbacks. Peter, these programs vary by state. I would not get into a reverse mortgage deal offered by the Fonz, or Robert Wagner, or other celebrity. These are more likely to be fee-laden and contain a “gotcha” that you describe. I would call reverse mortgage an option when you don’t have too many other options. I don’t recommend them, but they could be helpful in the right (difficult) situation. Also, if you do not trust your banker, find another bank. There are many community banks where you are more likely to receive helpful, ethical advice. The imprudent and unethical behavior of those in financial services, revealed in 2007-8 crisis, has never been properly adjudicated. In ‘getting away’ with their improprieties, they served a warning to most of us that their business model endangers the finances and personal well being of anyone who gets involved with them. And the research shows this: financial advisors have proven so dangerous to financial well being, legislation is required to ensure they put the clients interest before their own. Unsurprisingly it is this specific legislation that Trump has highlighted for destruction. High fees and loans that are only a fraction of the home’s market value are not the only reasons to avoid these products. Homeowners are required to maintain the property and to carry adequate insurance, both of which can be onerous if not impossible as the borrower ages — particularly if his or her needs to borrow in the first place. I do not understand how reasonable people can recommend this approach. The reverse mortgage company does not want to be a homeowner. It is my understanding that once the home with a reverse mortgage is no longer occupied by the mortgagee, by death or move to assisted living or nursing care, the loan must be repaid before title can be passed on to an heir. The AARP website has an extensive treatment of reverse mortgages. I am one of the 41% who downsized. The biggest challenge was emotional. Leaving a home we had made our own over many years and moving away from family so we could afford retirement. Question: has any one done the math on how much money would be owed in 15-20 years on a reverse mortgage of $100,000? When someone owns real estate, they enjoy what is called a “bundle of rights.” When they tie it up in something like a reverse mortgage, they lose some of those rights. Does anyone know just what rights they lose? I agree wholeheartedly with Peter about opaqueness! People should go into these mortgages without a lot of due diligence. Wouldn’t more folks consider HECMs if we could get reverse mortgages on our condominiums? For instance, my 600 sq ft, 1 bedroom condo is valued at > $320K, more than many larger homes. I heard there might be a change in the works. Any word? Dear Rico – I have wondered that question myself, since I’m a condo owner. This is an excellent topic for a future blog. One requirement of a HECM reverse mortgage that I have yet to see here is that HUD APPROVED counseling MUST be completed in order to receive a HECM. This costs $125–$200 and cannot be provided by a lender. The key for our particular situation was having guaranteed retirement income sufficient to easily cover our living expenses PLUS property taxes and hazard insurance PLUS maintainable savings sufficient to cover unexpected events, including medical, home maintenance, automobile replacement/maintenance, etc. Ours is but one of the possible scenerios, but the purpose of the manditory counseling is to objectively analyze the practicality of a reverse mortgage for your particular circumstance AND to learn how to evaluate and compare offers, given the purposefully confusing sales enticements used by different lenders to increase sales and profits. While difficult, it isn’t a process that has to be navigated without unbiased professional help.